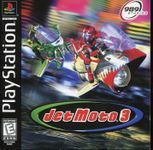 INTENSE Jet Moto Racing Returns! Harness the blurring speed of 11 ultra-realistic, all-terrain jet hover bkies. Feel the bone-smashing action of 19 treacherous, obstacle-ridden environments including suberranean graveyars, ancient cities, alien worlds and the wildest, most thrilling stunt tracks ever designed. Experience an all-new blazing fast 3D engine with realistic MotoPhysics handling. Jostle, sideswipe and rip it up in 1-player and 2-player competition.